Greetings friends! I’ve got some real exciting news for you. 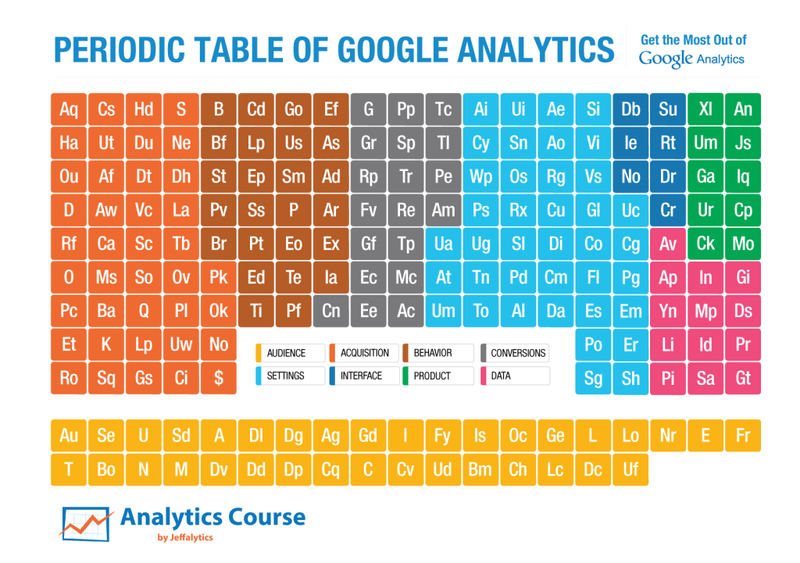 The 2016 edition of the Periodic Table of Google Analytics is now alive on Jeffalytics. This interactive table features 189 elements that describe the power of everything we can do with Google Analytics. The first periodic table was launched in 2013. The original table featured ~65 elements and the work was featured in several publications and downloaded thousands of times. Since Google Analytics is constantly changing, I began planning an update to the table pretty quickly after the original piece was introduced. But it took almost two years to finally publish from the original planned date. Why so long? Because I wanted to do things the right way. What does the right way mean? Well, I wanted to go beyond a printable document and really get in depth with each of these elements. But creating content for 190 elements takes time! So we have decided on a format that will work well for the format we have available. We will be releasing short, but information-packed videos that introduce each of the elements of the Periodic Table of Google Analytics. These will be released weekly on my YouTube channel to start. Eventually we will move to releasing element videos daily to avoid having this project last until 2020. Each element will also have a dedicated page on Jeffalytics that includes a written description of what we discuss in the video. The origin of the first Periodic Table of Google Analytics was purely organic. While teaching in-person Google Analytics classes, I created this visual to help my students better understand everything they can do with Google Analytics. 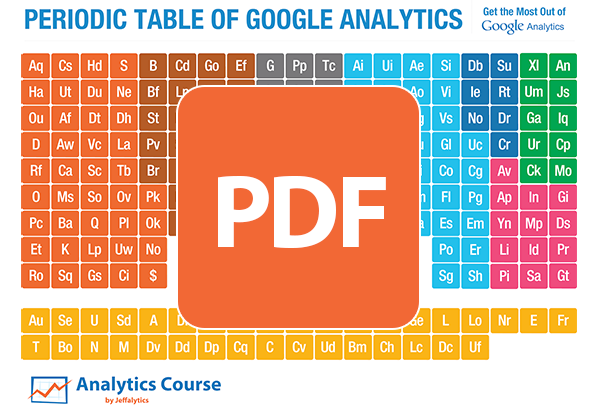 The Periodic table helps organize the many components of Google Analytics in an easily recognizable format. This iteration of the table is designed to reach a wider audience through YouTube videos and dedicated posts for each element. Most importantly, I do this for you, my friend. Many of you have already downloaded the PDF version of the original table. These in-depth videos explaining each element will help increase your knowledge or refresh your memory. If you are new to Jeffalytics, go here for the full awesomeness. Download the guide and share that awesomeness with your equally awesome friends. We will be releasing this video series on my YouTube Channel and embedding the videos into the periodic table of Google Analytics. Subscribing to the YouTube channel or to this blog through RSS is the best way to be alerted of new elements. Side note: In case you haven’t popped by the YouTube channel yet, it’s full of great content! You can also help me out by sharing the table or this post on your social networks. Every share really helps to get others to notice the awesome content. The series officially launches today. Check out the periodic table page to see our progress as we work our way through all 189 elements. Yup, it’s gonna be a long ride, folks, so hang tight with me. I (Jeff) will be guiding you through this series, but I am also open to having a few web analytics and marketing celebrities introduce some of the elements. If you have a question or two, or just want to say hi, hit me up here. Please share the periodic table with your friends and colleagues. I try not to ask for much in exchange for producing quality content on my website. But I would really appreciate your help here. Either by tweeting about the table, sharing the PDF with your team or even sending me a picture of the periodic table in your work environment.